Russia and Ukraine failed to resolve a gas pricing dispute during Sunday talks in Kiev. Gazprom says its demands have not changed and Kiev is expected to pay its debt of $1.95 billion by 06:00 GMT on Monday, otherwise the gas supply will be stopped. Gazprom’s position remained unchanged after EU-brokered negotiations finally ended around 2:30 a.m. Moscow time (10:30 p.m. GMT) on Monday, Gazprom spokesperson Aleksey Kupriyanov told reporters. 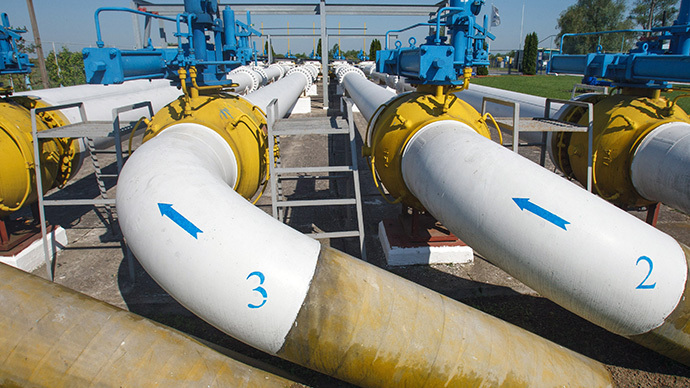 If Ukraine’s gas debt is not paid on time, Russia will be switching to an advance payment system, which will essentially stop gas supply to Ukraine, he added. "We reached no agreement and the chances that we will meet again are slim -- we are already on the plane heading back (to Moscow)," Kupriyanov told AFP. "If we receive no pre-payment by 10:00 am (0600GMT), then we obviously will deliver no gas." In his turn, Ukrainian Energy Minister Yury Prodan said that Ukraine is prepared for the cut-off of gas supply from Russia. However, the head of Ukraine’s Naftogaz said that EU Energy Commissioner Gunther Oettinger suggested a temporary price of US$300-385, adding that there is a chance that this compromise can be achieved before the deadline. The talks were attended by Gazprom head Aleksey Miller, Ukrainian PM Arseny Yatsenyuk, and EU Energy Commissioner Gunther Oettinger. The previous round of talks over the price of Russian gas for Ukraine failed to reach a solution to the standing Ukrainian $1.95 billion gas debt. Ukraine have not been paying for most of the gas supplied by Russia this year and demands that the contract on the deliveries be amended. Russia offered a discount to the price, but Ukraine rejected it, saying it wants the price to be lower. Ukraine has been pushing for the gas price to be set at $268 per 1,000 cubic meters, Ukrainian Energy Minister Yury Prodan told reporters on Saturday. The latest price proposed by Russia stands at $385. On Friday, Kiev said it is ready to pay $326 per 1,000 cubic meters.